Karl Marx was a German philosopher, economist, and revolutionary socialist. Marx’s theory of dialectical materialism holds that human societies progress through class struggle, a conflict between an ownership class that controls production and a dispossessed working class that provides the labour. He called capitalism the “dictatorship of the bourgeoisie,” believing it to be run by the wealthy classes for their own benefit and he predicted that the internal tensions it produced would inevitably lead to its destruction and replacement by a new system, socialism. He argued that the working class would take political power in the form of a dictatorship of the proletariat and would eventually establish a classless society to be called socialism or communism. Marx also argued for revolutionary action to topple capitalism and bring about socio-economic change. 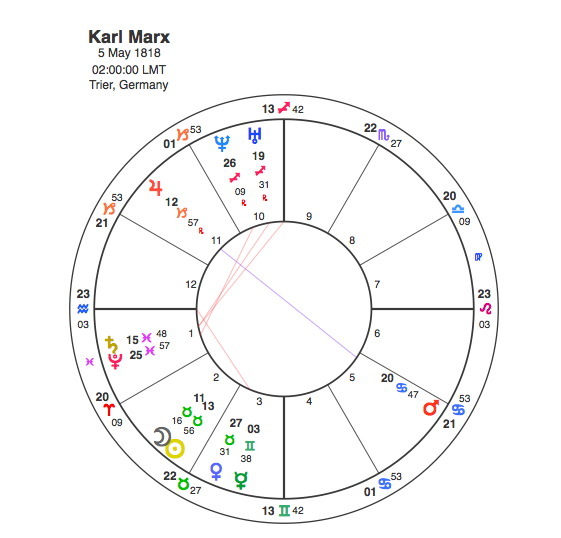 Karl Marx was born with the Sun and Moon in conjunction in Taurus in the 2nd house. At first glance this is not what you would expect for the theoretical father of communist revolution. Taurus is arguably the most materialistic of all signs and the 2nd house is the house of money and possessions. This, however, is a chart that does not apply so much to the individual but to his theories. The Sun and Moon conjunct in the 2nd house is capitalism itself. The hidden fact in this chart is that the Moon is just about to eclipse the Sun. The Taurean 2nd house Sun is about to be blotted out, so Marx’s view of the inevitability of the end of capitalism is shown by this eclipse. The Ascendant in a chart is the method of expression of the person concerned. In this chart, Aquarius, the sign of the rebel, is rising so the downfall of capitalism from the eclipse would be expressed through political and social revolution. Marx’s theories were laid out in Das Kapital, the first volume of which was published in1867 as Pluto arrived to conjunct his Sun. Obviously this was a watershed for Marx, but the publication was also a turning point for capitalism itself. Pluto was not discovered until 1930, but in the study of astrological charts of people born before the 20th century, it’s transits do seem to have an effect in some cases but often the true impact of this effect is not clearly apparent at the time. It becomes clearer after their death and perhaps even more so once the Pluto had been discovered. An example of this could be seen in the role of Uranus in the life of Henry V111. The true impact of Pluto’s transit to Marx’s Sun and the publication of Das Kapital would not be seen until the following century. An eclipse always has it’s strongest impact in the parts of the world where it appears at its fullest. The eclipse in Marx’s chart of May 1818 was strongest across the whole of Russia, Eastern Europe,most of Northern Asia and China. The Russian Revolution of 1917 is the one event that Marx predicted. 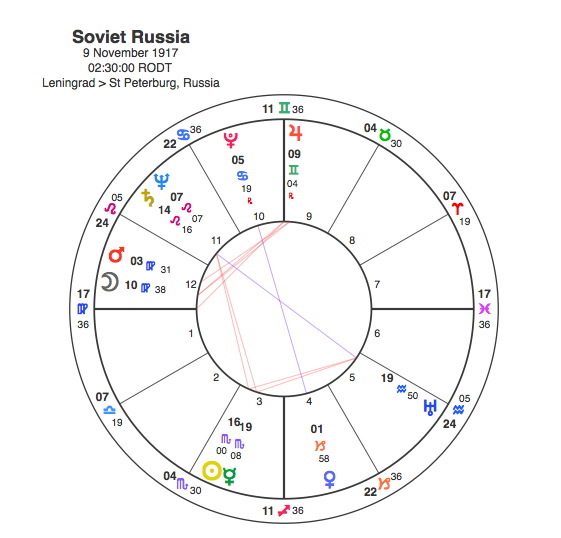 This birth chart for Soviet Russia is taken from the moment of the acceptance of the Decree of Constitution of Power which effectively gave control to the Bolsheviks. The Sun in the Soviet chart is in Scorpio, the sign which is most associated with revolution and transformation. The Moon and Ascendant are in Virgo, the sign of the workers. The Sun is the apex of a T Square from the opposition between Uranus and Saturn. Uranus in Aquarius, is the socialist ideal of the classless society where everyone lives in harmony and equality. Saturn in Leo is the complete opposite, it is an authoritarian and autocratic rulership. If anything symbolises the dictatorship of the proletariat it is this opposition. It also clearly shows the conflicting themes that characterised Soviet Russia. The tension between these two ideas projects powerfully onto the Sun. Whenever the Sun is the apex of a Tsquare the individual concerned becomes extremely powerful and this was certainly the case with the Soviet Union. The other important point is that the Soviet Sun is opposite Marx’s Sun and so opposite the eclipse of capitalism. The Soviet T Square forms a Grand Cross with the Marx chart Sun and Moon. A Grand Cross is an aspect of extreme tension and so the revolution and overthrow of capitalism predicted by Marx occurred. Pluto’s conjunction to the Sun in Marx’s chart in 1867 resulted in the publication of Das Kapital and the prediction of the inevitable overthrow of capitalism. Pluto moves very slowly and would not make another aspect to this Sun for 80 years,long after Marx’s death. The next one was the square in 1949 which coincided with Mao Tse Tung’s Communist revolution in China. Mao Tse Tung had a T Square between the Moon in Leo opposite Venus in Aquarius, square to Uranus in Scorpio. This is another example of an individual being pulled in two different directions with the instinctively autocratic Leo Moon and the noble idealism of Venus in Aquarius. This opposition focuses onto Uranus in Scorpio which would have to be the simplest astrological symbol for political revolution. With the Sun and Ascendant in Capricorn however Mao would be a pragmatist and his Sun, Moon and Ascendant combination was always far more likely to produce a dictatorship of one rather than of many. Mao’s T Square is also aspected to Marx’s Sun and his Moon is exactly in square to it. 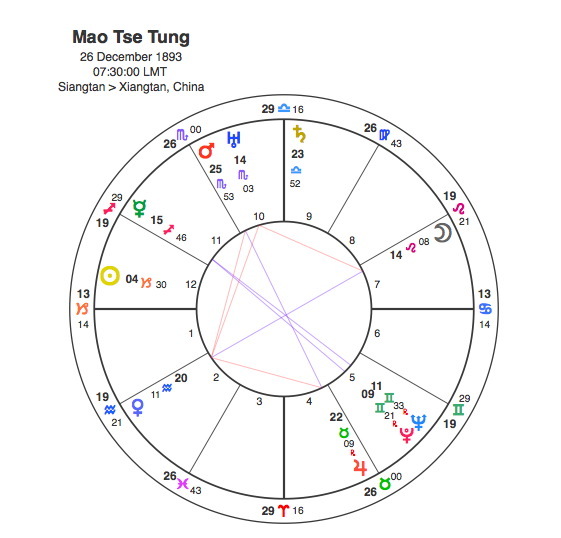 In 1949 Pluto was conjunct Mao’s Moon triggering the T Square and in square to Marx’s Sun. This was the other major stage in the downfall of capitalism. The next transit Pluto would make to the Marx / eclipse of capitalism Sun was in 1989 – 90 at the time of the fall of the Berlin Wall and the collapse of the Soviet state. This time Pluto was conjunct the Soviet Sun so it was a revolution that happened to the state originally set up by revolution. Pluto was also opposite Marx’s Sun showing the dramatic end of the communist threat to overthrow capitalism. It lasted for a long time, and its true that capitalism was eclipsed certainly in the Soviet bloc and China, but any eclipse passes, the Moon moves away and the Sun shines as brightly as before. Karl Marx may have correctly predicted the eclipse of capitalism but not its end.